The Omano OM4724-B is the sister microscope to the OM4713-B. 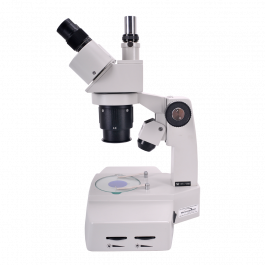 It is a solidly built dual-power, stereo microscope designed to withstand the rigors of an industrial setting at an affordable price. It includes dual power, 20x-40x magnification and variable halogen lighting, making it one of our most popular dual power stereo microscopes. 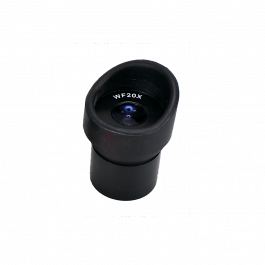 WF 10x eyepieces and eyecups are included with dual diopters for convenient individual eye adjustments. 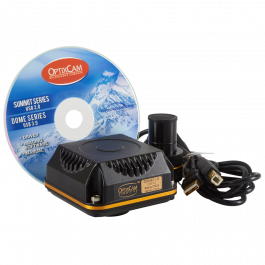 The interpupillary adjustment range is 50-70mm to allow for multiple users, and the optional trinocular port will connect the microscope with our excellent NEW OptixCam Summit 1.3, 3.0, 5.0, or 10.0 megapixel microscope cameras. Halogen lighting provides a wonderfully clean image of the specimen. This Omano OM4724-B includes transmitted and reflected halogen illumination.. The stand is double-wide for both greater stability and convenience. This stereo microscope is manufactured under the strict guidelines of ISO 9001:2000. The Omano OM4724-T is the trinocular sister microscope to the OM4724-B. 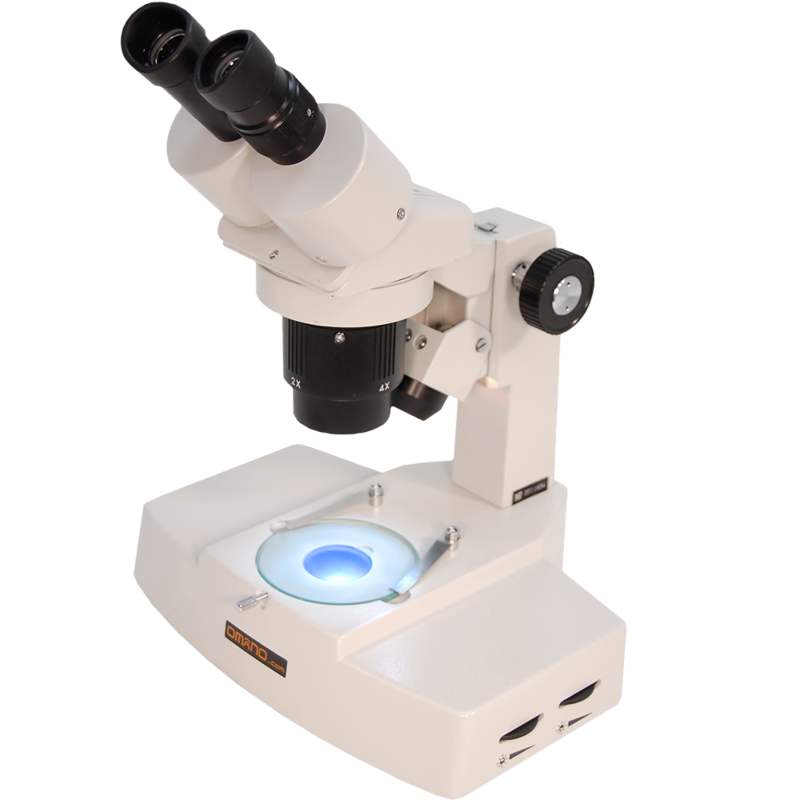 It is a solidly built dual-power, stereo microscope designed to withstand the rigors of an industrial setting at an affordable price. 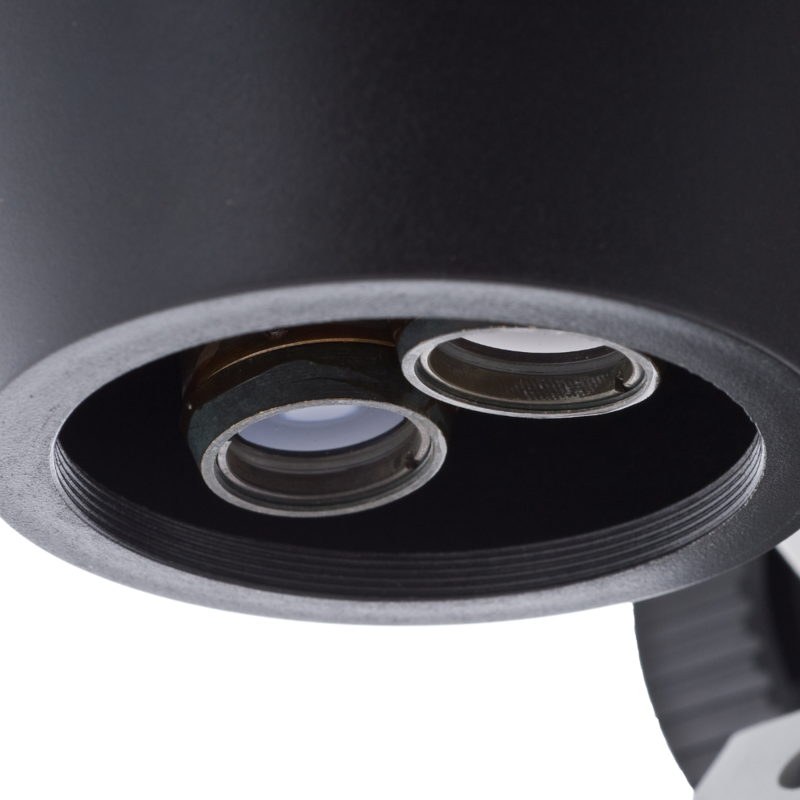 The trinocular port allows for use with one of our excellent NEW OptixCam Summit 1.3, 3.0, 5.0, or 10.0 megapixel microscope cameras. It includes dual-power, 20x-40x magnification and variable halogen lighting, making it one of our most popular dual power stereo microscopes. WF 10x eyepieces and eyecups are included with dual diopters for convenient individual eye adjustments. 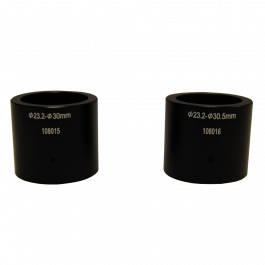 This set includes two spacing collars which will slip onto the 0.5X reducing lens adapter of an Optixcam SK2 or SK3 series camera, and allow it to fit any microscope with a smooth eyetube or trinocular port with 30.0mm or 30.5mm inside diameter. 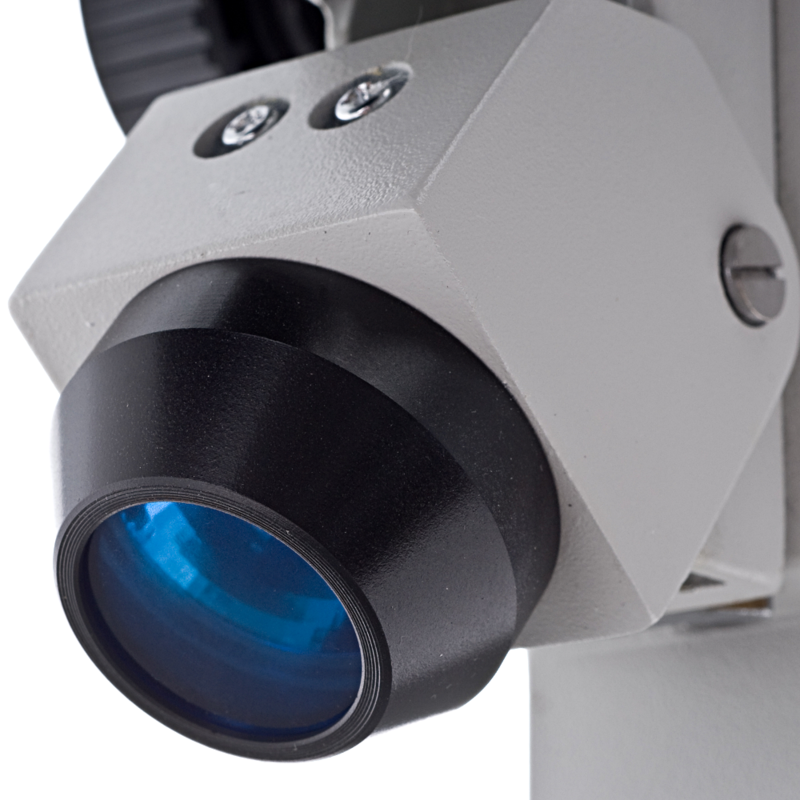 Dust, dirt and debris can seriously degrade the optical performance of any microscope. 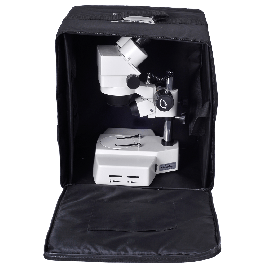 Our new padded nylon carrying and storage case is a great way to minimize contamination and protect your Omano microscope investment. The wrap-around double-zippered side entry panel opens completely for ease of access. Rigid side and bottom panels unfold and secure with hook and loop to form a protective cargo area for your microscope. Front and back panels contain dual-density 3/8" foam for added protection. Two elastic retention straps keep your scope securely in place while an inner compartment holds important documents. The carrying strap is full-length, double-stitched heavy-duty nylon webbing and the carrying handle is padded for comfort. For added convenience, the case top includes a clear vinyl pocket for an identification / security label. 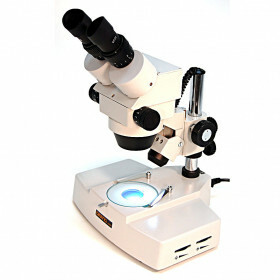 - All Omano 4400, 4700 series, 9949 & 9959 series binocular and trinocular stereo microscopes. *** Please note that this is a carrying / storage case and is not suitable for shipping such as in aircraft holds. It has a weather-resistant aluminum alloy frame with reinforced corners and side panels encasing a contoured hard-foam interior. The foam is shaped to fit the Omano 4400 / 4700 series stereo microscope and hold it securely in place, while providing generous cavities and storage areas for accessories, eyepieces, slides and documents. Heavy-duty hinges, locking clasps and a solid carrying handle are designed to withstand the rigors of daily use. Note: Not recommended for shipping or checked baggage air travel. 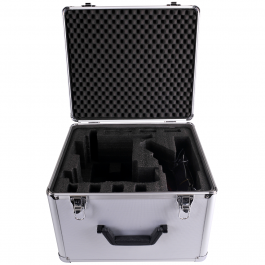 This case is designed for carrying and storing your microscope--it is not designed for shipping purposes. The Omano OM4724 is a solidly built dual power, stereo microscope designed to withstand the rigors of an industrial setting at an affordable price. 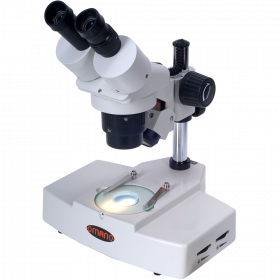 It includes dual power, 20x-40x magnification and variable halogen upper and base lighting to make it one of our most popular dual power stereo microscopes. This is a microscope with crisp optics and solid industrial design that enjoys intensive daily use. The Omano OM4724 is the 20x/40x version of the OM4713 (10x/30x). 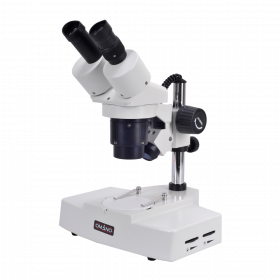 Solidly built with a classic fixed arm stand, it is a stereo microscope designed to withstand the rigors of an industrial setting at an affordable price. 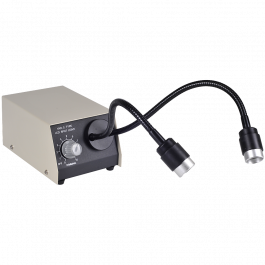 It includes dual power, 20x-40x magnification and variable halogen upper and base lighting to make it one of our most popular dual power stereo microscopes. 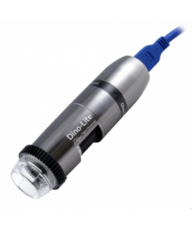 Like its 4713 sister, the OM4724 is another microscope that enjoys intensive daily use. 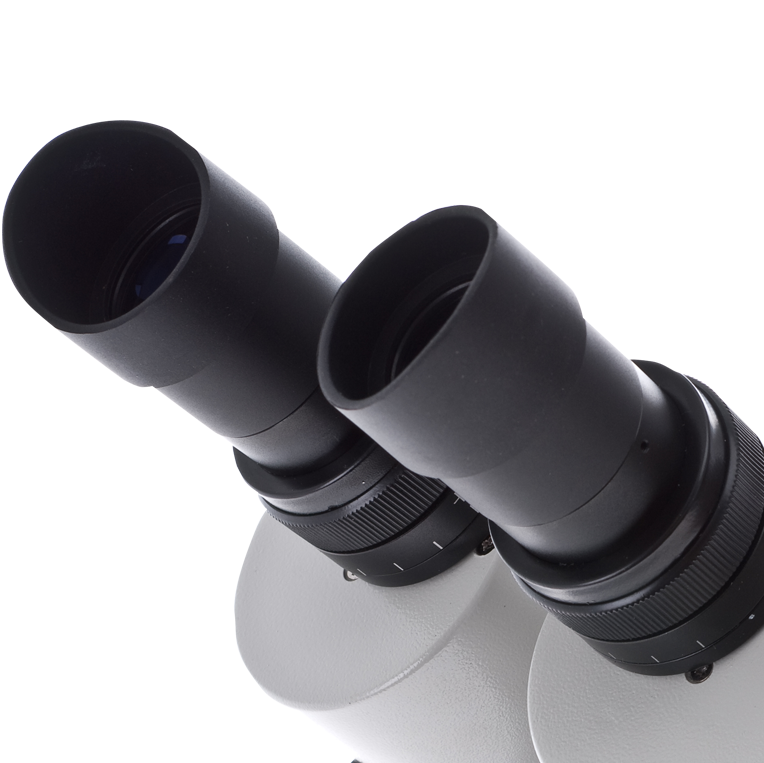 With two wide field WF 10x eyepieces and achromatic, coated 1x and 3x objective lenses, the OM 4724 offers 10x/30x dual power magnification. Built more solidly than the OM24L, this stereo microscope has proved endearingly popular over the past ten years owing to a combination of good quality optics, rugged construction and affordable price. It is well-known for its distinctive, double wide base. The head, which is inclined at a 45 degree angle, rotates through 360 degrees for flexible viewing positions. A diopter on the left ocular enables individual eye adjustments while the interpupillary distance adjusts through 50-70mm. 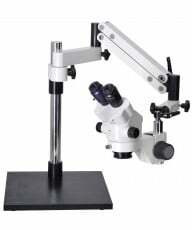 The OM4724 has a fixed arm stand - a classic microscope stand that is built to last with a distinctive double-wide base. 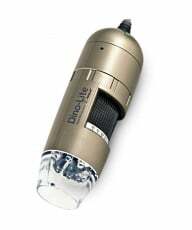 The base has an integrated transmitted illumination for translucent specimens with the top (incident) light attached to the upright. We now have an optional hard-sided aluminum microscope case to ensure your microscope investment is always well-protected from the dust, nicks, scratches and dents from everyday use. Simply select the aluminum case from the options above, prior to checkout. Rubber eyecups, 2 spare bulbs, reversible black/white stage plate, frosted glass stage plate, vinyl dust cover, manual. Exceptional Value - Save $50 while supplies last. 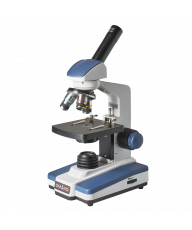 All Sales Final.The Omano OM4724 is a solidly built dual power, stereo microscope designed to withstand the rigors of an industrial setting at an affordable price. 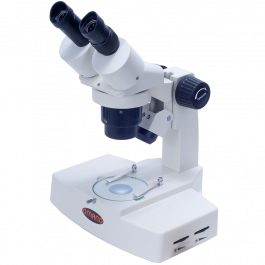 It includes dual power, 20x-40x magnification and variable halogen upper and base lighting to make it one of our most popular dual power stereo microscopes. 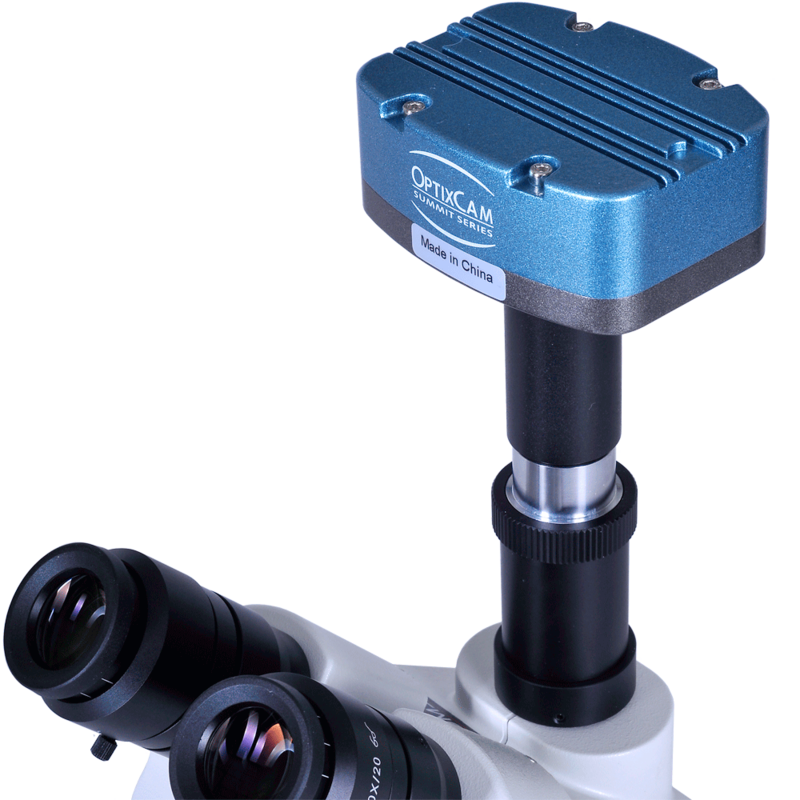 This is a microscope with crisp optics and solid industrial design that enjoys intensive daily use.OpticsThe Omano OM4724 is the 20x/40x version of the OM4713 (10x/30x). 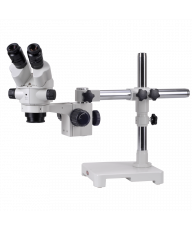 Solidly built with a classic fixed arm stand, it is a stereo microscope designed to withstand the rigors of an industrial setting at an affordable price. 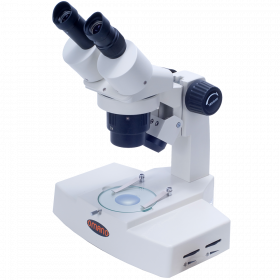 It includes dual power, 20x-40x magnification and variable halogen upper and base lighting to make it one of our most popular dual power stereo microscopes. Like its 4713 sister, the OM4724 is another microscope that enjoys intensive daily use.Focus & IlluminationWith two wide field WF 10x eyepieces and achromatic, coated 1x and 3x objective lenses, the OM 4724 offers 10x/30x dual power magnification. Built more solidly than the OM24L, this stereo microscope has proved endearingly popular over the past ten years owing to a combination of good quality optics, rugged construction and affordable price. It is well-known for its distinctive, double wide base.The head, which is inclined at a 45 degree angle, rotates through 360 degrees for flexible viewing positions. A diopter on the left ocular enables individual eye adjustments while the interpupillary distance adjusts through 50-70mm.StandThe OM4724 has a fixed arm stand - a classic microscope stand that is built to last with a distinctive double-wide base. The base has an integrated transmitted illumination for translucent specimens with the top (incident) light attached to the upright.We now have an optional hard-sided aluminum microscope case to ensure your microscope investment is always well-protected from the dust, nicks, scratches and dents from everyday use. Simply select the aluminum case from the options above, prior to checkout.AccessoriesRubber eyecups, 2 spare bulbs, reversible black/white stage plate, frosted glass stage plate, vinyl dust cover, manual.